There are several reasons why people behave like this. One explanation is that online discussion doesn’t have any of the usual communications cues, such as tone of voice or facial expression. As a result, it is easy for people to misinterpret and therefore say the wrong thing. Another potential reason for trolling is the impact of perceived distance. When people are far apart, their communication tends to be less empathetic. So, online, people tend to find it easier to be rude to each other than would be the case in the “real world”, face-to-face. However, a new study provides an alternative explanation for trolling behaviour – and it is not necessarily good news because it means any of us could easily become an online troll. The researchers found that trolling is contagious. In an analysis of over 16m online posts, the study discovered that negative commentary was catching. When someone provided negative comments early on in a discussion, it was much more likely that other people became negative too. The researchers also looked at the impact of mood in an experiment where they used techniques to create a low mood in participants by providing different kinds of personal feedback. When people were placed in a low mood as a result of negative feedback they were more likely to place negative comments in a discussion group. In other words, if you are not in a good mood and an online forum or social network already has negative comments on it, you are going to be prone to being a troll. That means trolls are not necessarily nasty people, out to do damage, but ordinary folks who just happen to be subconsciously influenced. This is likely when you consider the reaction of trolls when their impact is pointed out to them. Four years ago, Professor Mary Beard from the University of Cambridge was abused online by a troll. However, when the impact of his comments was explained to him, the perpetrator was contrite and apologetic. Other instances like this have been documented and it would appear that people can easily become trolls. The combination of low mood, other negative comments and the lack of non-verbal communications cues, together with the impact of perceived distance all combine in a potent mix where any of us could easily become a nasty troll. What this all means is that we need to take special care ourselves to avoid inadvertent trolling. The first step is to avoid taking part in online discussions when you are not feeling your best. Go for a walk, do some mindfulness techniques, or listen to some music – anything that will make you more cheerful. Then you can take part in some social activity online. If you are already in a good mood, then the next step is to make sure that you take a break before you respond. Read the comments, then do something else, preferably on a separate topic. This will act as an “interference task” for your memory, helping to remove the impact of any negative comments you have already seen. Finally, write your comments and then either save them for review later or go to another tab, do something else and then come back to your comments. This will give your brain a chance to reflect on what you intend saying before you press the submit button. In other words, the way to avoid trolling online is what we all do in the real world in face-to-face communication. We stop. think and reflect on what others might be thinking before we comment. Instant commenting online is the route to becoming a troll. 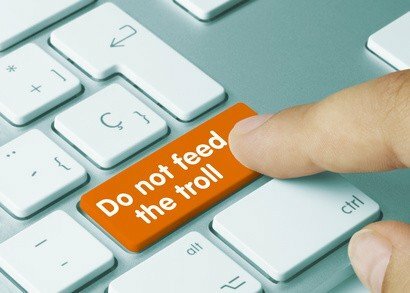 If you don’t want to be a troll – slow down.